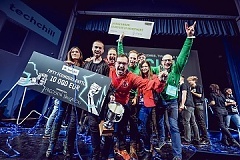 Precision Navigation Systems, a startup team from Estonia, grabbed the main prize at Fifty Founders Battle during TechChill - the biggest Latvian tech event of the year. The lucky team is going home with 10 000 EUR from TechChill Foundation and a fast track to the Silicon Vikings Startup World Cup Finals in San Francisco, the conference representatives reported. According to Bank of Lithuania projections, in 2019 growth in the domestic insurance market should moderate compared to the previous year, while life assurance and non-life insurance markets are anticipated to grow at an even pace, even though their growth rates have varied significantly over the last few years. Results of the Labour Force Survey conducted by the Central Statistical Bureau (CSB) show that 72.8 thousand people were unemployed in 2018. Compared to 2017, number of unemployed persons dropped by 12.6 thousand or 14.8 %. Last year, Latvian unemployment rate constituted 7.4 %, which is 1.3 percentage points lower than in 2017. Unemployment rate among females still was lower than among males – 6.4% and 8.4%, respectively. Listed Estonian construction group Nordecon on Thursday handed over to the Academy of Security Services the academy's new study building in the eastern Maarjamae district of Tallinn, built at a cost of 19 mln euros, Nordecon said. During his visit to Germany, Latvian Transport Ministry’s state secretary Kaspars Ozolins and Port of Hamburg chief executive officer Ingo Egloff today signed a memorandum of understanding to promote closer cooperation among Latvian and German ports, BC learned from the ministry.